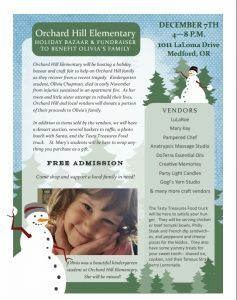 MEDFORD, Ore. — It’s been a tough couple of weeks for students, teachers, and families at Orchard Hill Elementary after one of their students, 5-year-old Olivia Chapman, died after a Medford apartment fire sent her and four other children to the hospital in November. On Friday, the school is having an event where some of the funds will go towards supporting Olivia’s family. The event will take place in the school’s gym, where they will have vendors, pictures with Santa, and much more. Principal Shawna Schleif says the coin drive they had last month for Olivia raised over $3,000, but they wanted to do more. Principal Schleif says it’s meant to be a fun and community-minded event in service of a family that needs support. The event is free for everyone attending.